We awoke at minus two degrees, camped at over 4000m in the quarry on the Sanetti Plateau, freezing, with the wind chill factor making it worse. Mist was coming in as we cooked up coffee and a hasty breakfast, breaking up camp as quickly as possible. Everything was wet and grimy, the steel awning poles draining most of the heat from our hands, the remainder going when we had to wash off the filth. However, with sleet falling, we knew it would have been much worse had it rained. 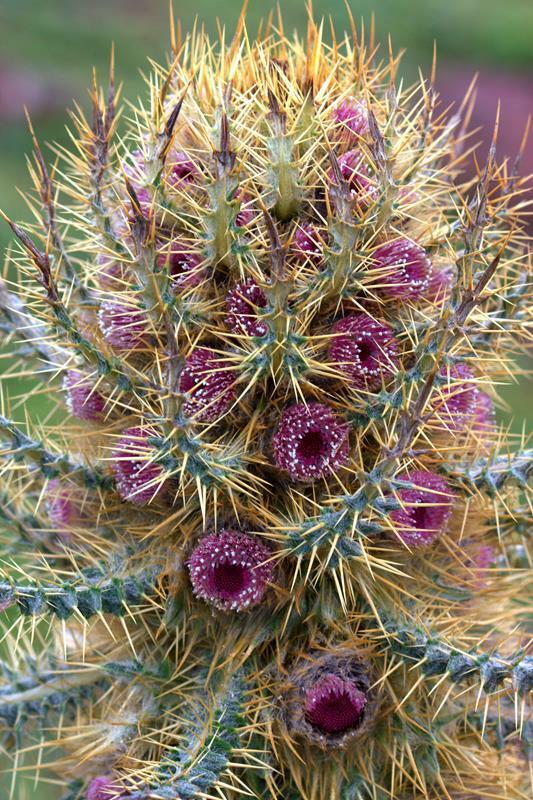 A stunning cacti specimen of the Bale Mountains. 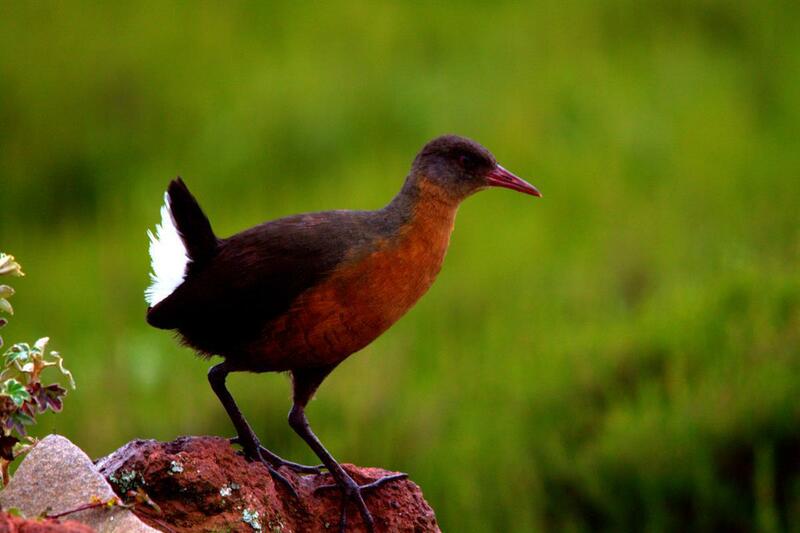 Rouget’s Rail, spotted when driving out of the Bale Mountains, is endemic to Ethiopia and Eritrea. 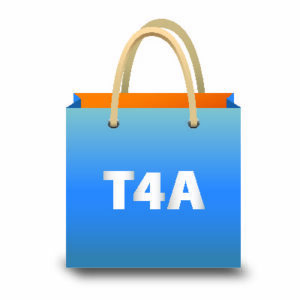 We drove west, finding more direct routes than travellers had thus far passed onto T4A. Again on the higher ground we passed by enormous crop fields, mostly ploughed with oxen, and then as the ground fell away, some spectacular scenery on our way to Sof Omar. Passing by a colourful scene of people working on the land. 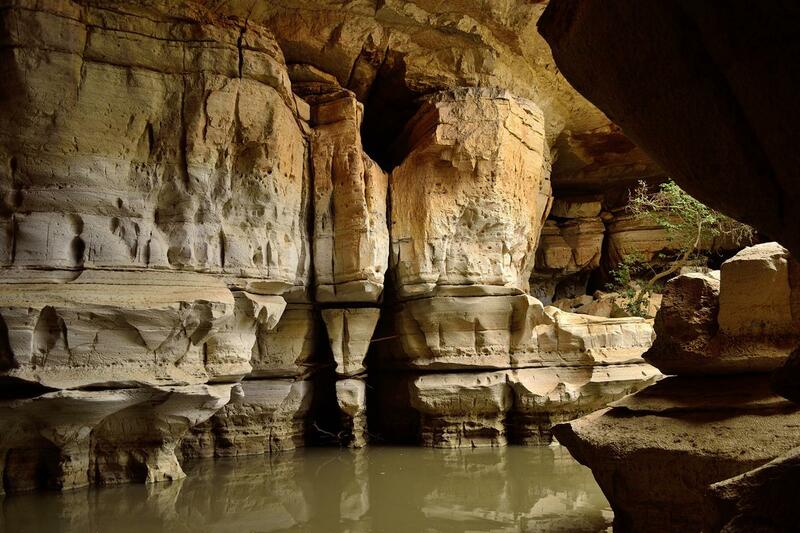 Sof Omar Cave, at 1.5 km long and with 42 entrances, is the longest cave system in Ethiopia and some sources claim the longest in Africa. These caves with their many pillars and beautiful rock formations were shaped by the Shenan River eroding the limestone over ages; rather miraculously this river still disappears into the zig-zag of passages that run approximately south-east. Beautiful rock formations of the Sof Omar Caves. According to tradition Sof Omar was the name of a Muslim holy man who lived in the area and today people still visit Sof Omar during an annual religious festival. 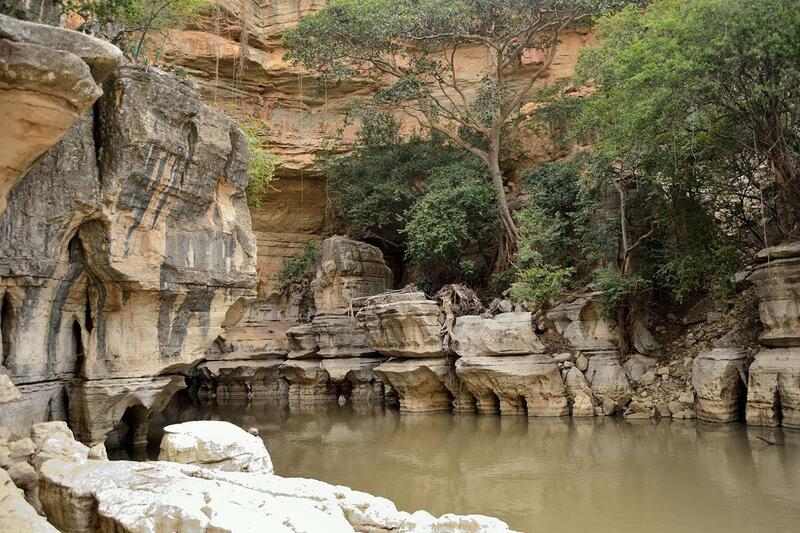 The Shenan River has been carving the rocks of the Sof Omar Caves for millennia. The muddy Shenan is not only a source of washing and drinking water for the small community living at the mouth of the cave, but also for the people and their livestock from the nearby Sof Omar town. Donkeys carry yellow containers filled with water up the rocky, steep sides of the kloof and livestock gingerly descend to drink. 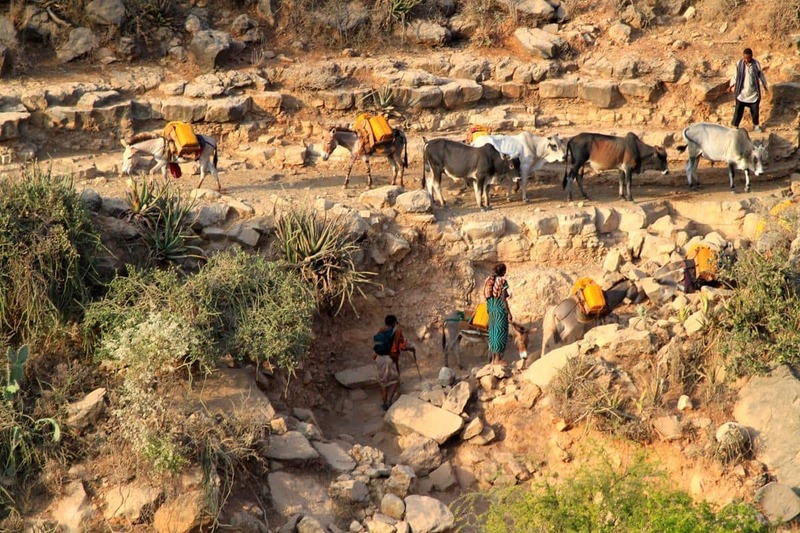 Donkeys carry yellow containers with water up the steep slopes while cattle descend to drink at the mouth of the caves. We camped on a worn patch of grass, keeping a good eye on the fearless troop of monkeys who delighted in climbing over the vehicle and even up onto the slippery awning of the rooftop tent. That evening we were ‘protected’ by a volunteer security guard who had set up his bed in spite of our assertions to the contrary. Knowing that we had some hard driving before we reached Harar, we were up as dawn broke, determined to make best progress. 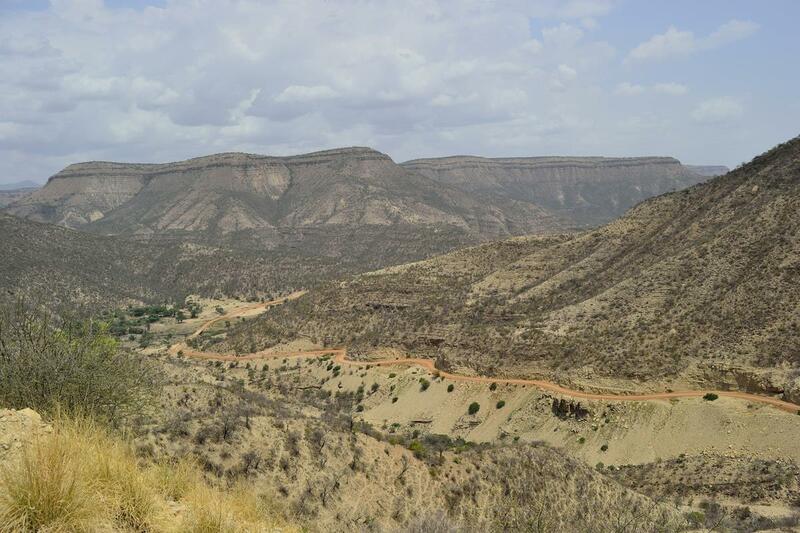 The road to Sheik Hussein took us through some arid landscape and the potholed gravel road was corrugated with loose rocks. A path winding up the canyon. From there the road improved and we were amazed at the steep, scenic drive through three inter related canyons. In retrospect it was unsurprising that we saw no other vehicles on the road for many hours. We passed through three canyons shortly after Sheik Hussein. We proceeded north through a thunder storm to intensely populated, higher ground around 2 500m. Here there is no flat land. The green, continuously rolling countryside is all cultivated, as far as the eye can see. 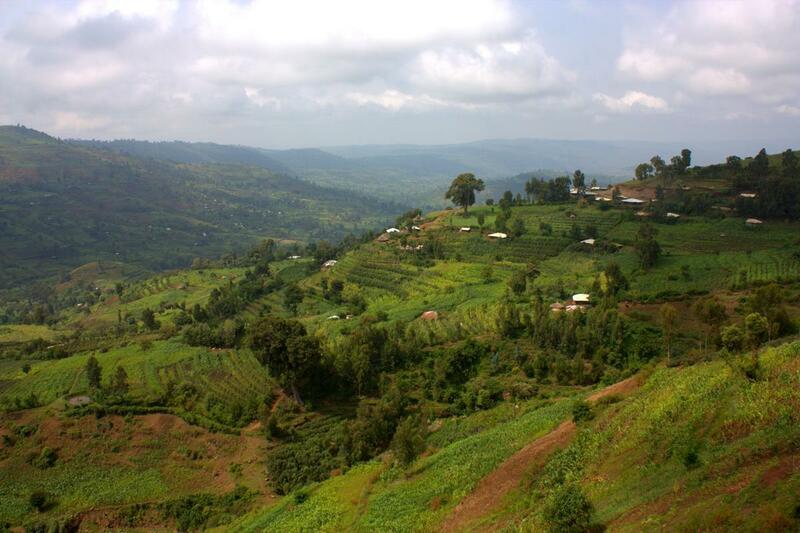 In other parts of Africa such terrain would be likely left untouched, but here the slopes are all terraced and planted. Beautifully terraced and cultivated slopes as far as the eye can see. The roads have to conform to the slopes, often around 8-10% in gradient, which mean low gear climbs and descents as the Hilux is heavy and takes time to stop in the event of livestock running in front of us. With these conditions, a 400km drive can take all day, regardless of the road surface and leaves the driver drained. 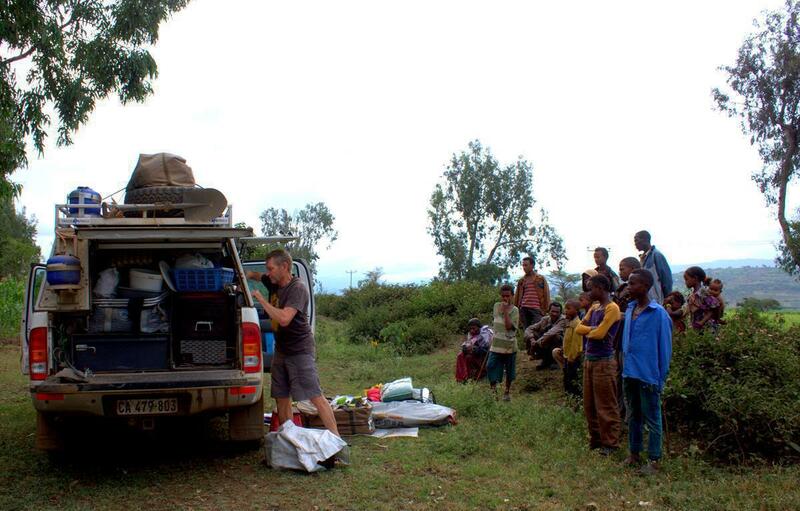 With over 600km to reach Harar, we knew we were in for a bush camp again and started looking for a spot around 4pm. We realised that, with the press of people, it would be near impossible to find a peaceful spot. 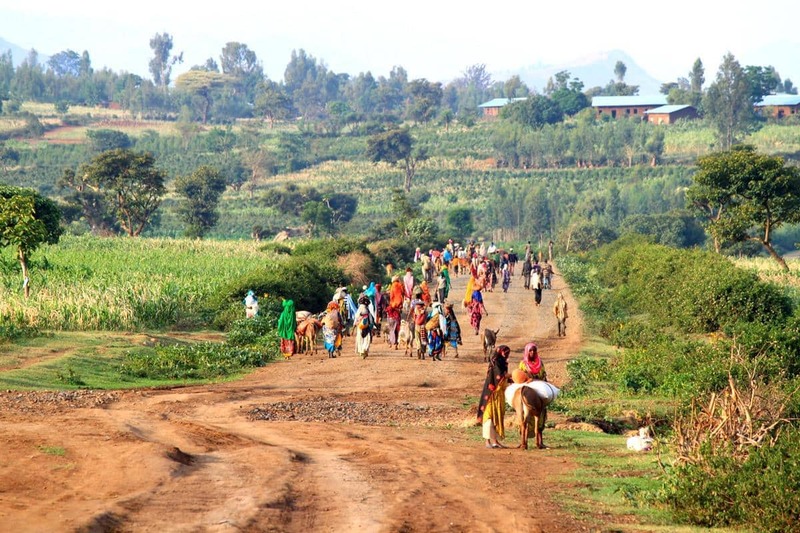 There are more people and livestock on the Ethiopian roads than vehicles. As the sun set we had waypointed two possible camp spots on the GPS; one on the electricity supply cutline and the other in a quarry. It later turned out that the quarry doubled as the offload spot for cattle shipments, so we settled down on the cutline, only to find that it was a thorough fare, with bodies, cattle and goats brushing past our kitchen as we cooked dinner. Surprisingly, as darkness fell, the local people seemed to change their manner entirely, hardly engaging us as they politely passed. We slept well. After our early start we thoroughly enjoyed the warm Mulewa which we bought next to the road. 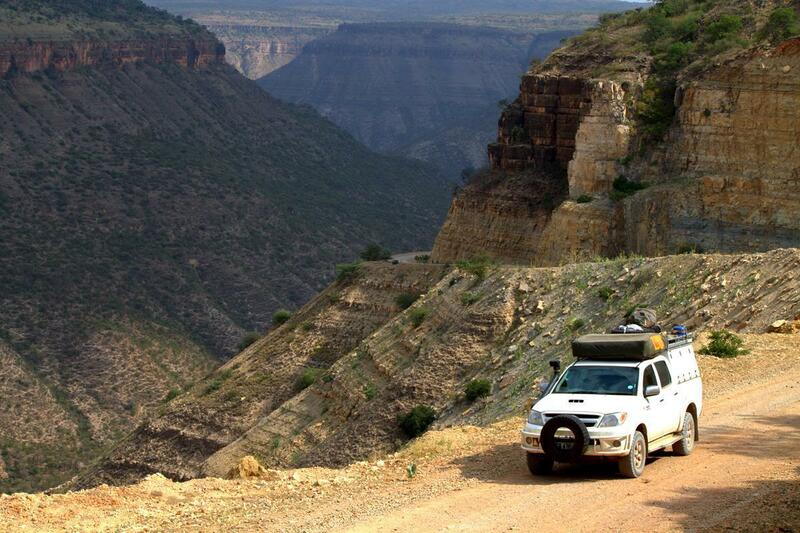 Up early again before the foot traffic started through our camp we continued on the shockingly bumpy road to Harar. We were worried about a persisting clonking noise at the back of the vehicle, not knowing if it was something serious. Pete had crawled under the chassis in the filth and dust half a dozen times and we once stopped and unpacked the whole canopy, of course with a dozen onlookers, to try to find what was rattling. Unpacking the canopy, with a dozen onlookers. It was only when Pete climbed on the running board whilst I drove that the noise stilled and he could feel something moving under his weight. We realised that one of the welds on the running board must have cracked and that vibration had now taken its toll. He used a few big cable ties to winch the two parts together until we could find a welder on the side of the road. Arriving in Harar we made our way to the Tourist Information Centre, only to find that it was no longer at the indicated waypoint. Fortunately a local guide assisted us when we arrived at the correct location. Goats freely roam the streets of Harar. A fellow traveller had recommended Rhoda’s Guest House, a traditional Harari house in the old city and our guide, Image, took us straight there. As it was fully booked we moved on to Rhoda’s sister, Zubeyda, who also runs a guesthouse close-by. We had parked the truck in the grounds of a ‘garage’ a few hundred metres away and shuttled over what we needed. We were travel weary and looking forward to a break. 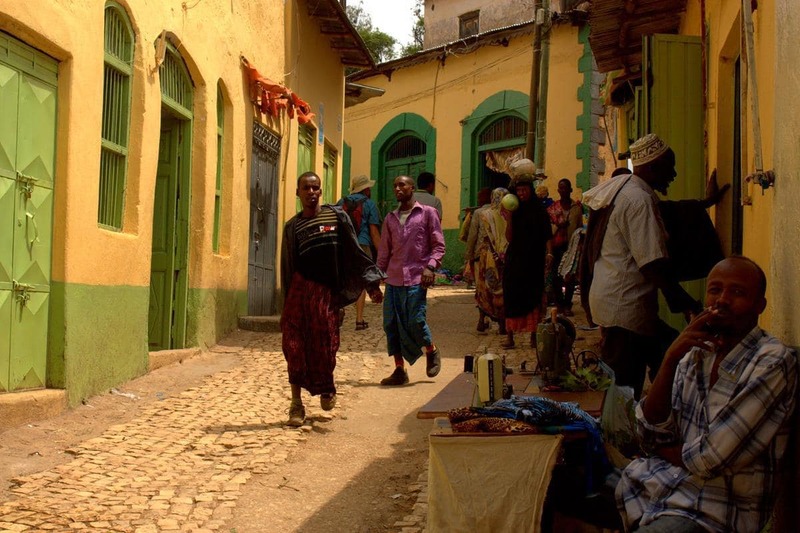 A colourful street in Harar. 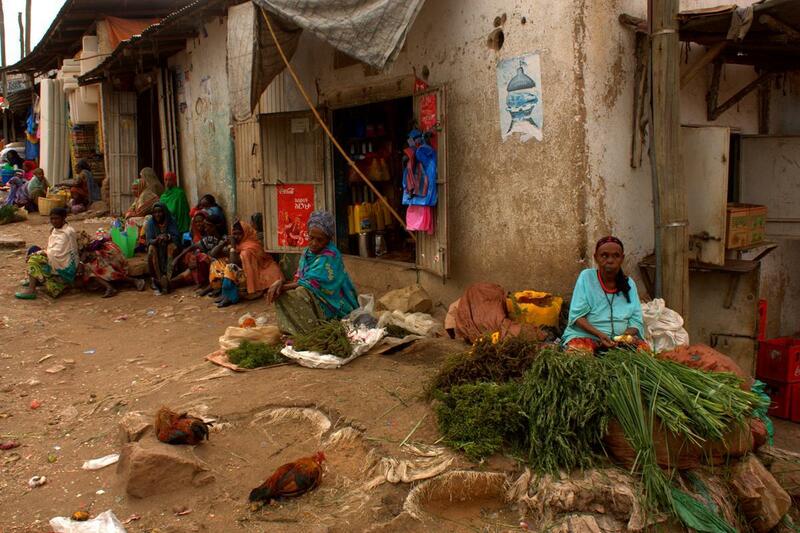 Harar, situated in eastern Ethiopia, dates back to the 12th century and lies at an altitude of about 1700m. The city is divided into the old and modern sections and formerly was a commercial hub between Arabia and Africa. It has become regarded as the 4th most important Islamic cultural city, after Mecca, Medina and Jerusalem and its ‘Jugal’ or external wall still exists, separating the old from the new. It encloses 82 mosques, over a hundred holy tombs and worship places as well as thousands of traditional Harari houses. Formerly a site of conflict between Muslim and Christian forces, Harar is now an example of peaceful co-existence between these two religions. 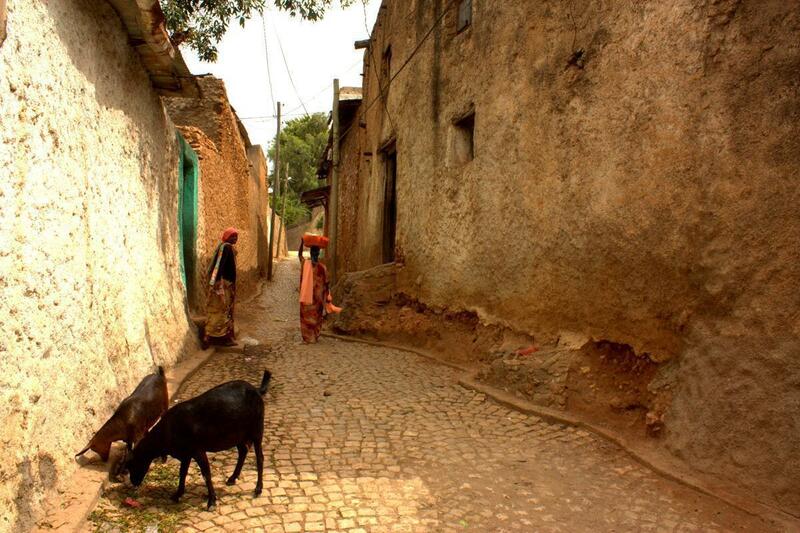 Harar has many narrow alleys. A guide is almost an essential in Harar as this colourful, bustling walled city contains a myriad of narrow, twisting cobble stone alleys. Here foreigners are welcome and few people object to, or demand payment for photographs. 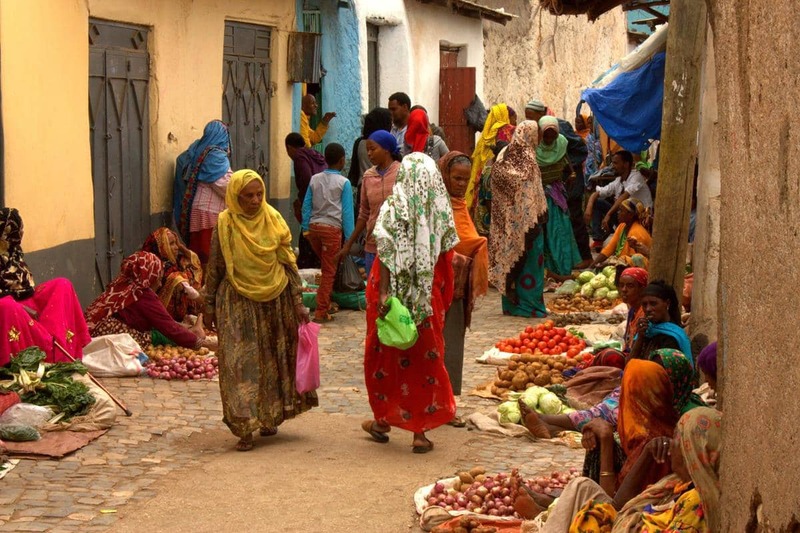 One of the big markets in Harar. 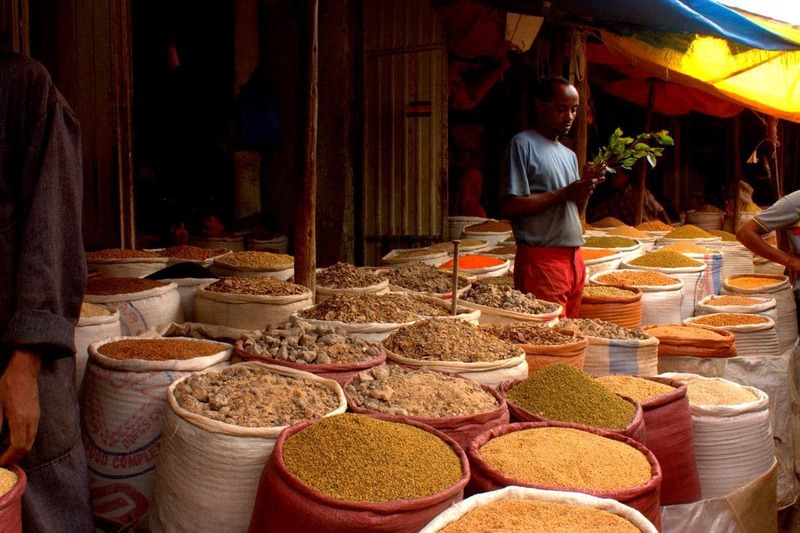 The markets are a kaleidoscope of colour and smells. 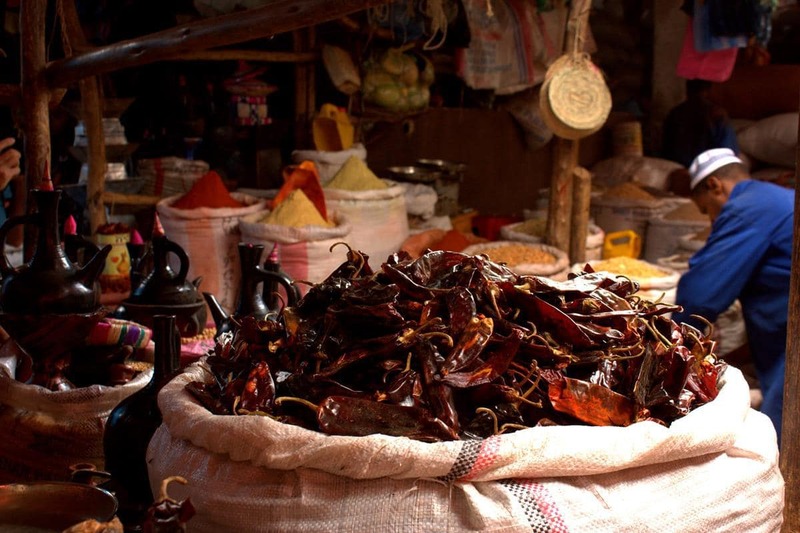 We found the old city with its kaleidoscope of colours, big markets and variety of spicy smells more interesting than Stone Town in Zanzibar, even though the lack of hygiene is at times nauseating. The lack of hygiene is at times almost nauseating. Harar is also known for ‘the hyena men’. For generations hyenas have scavenged within the city walls at night and became ‘friendly’ with a group of men who feed them at some of the 5 city gates, also allowing tourists to feed them. Unfortunately we missed out on the hyena feeding as it poured with rain when we planned to go. However, we did get to enjoy traditional Harari food; the traditional breakfast, called Mulewa, and Fetira, which seem to be the standard dish in Harari restaurants. 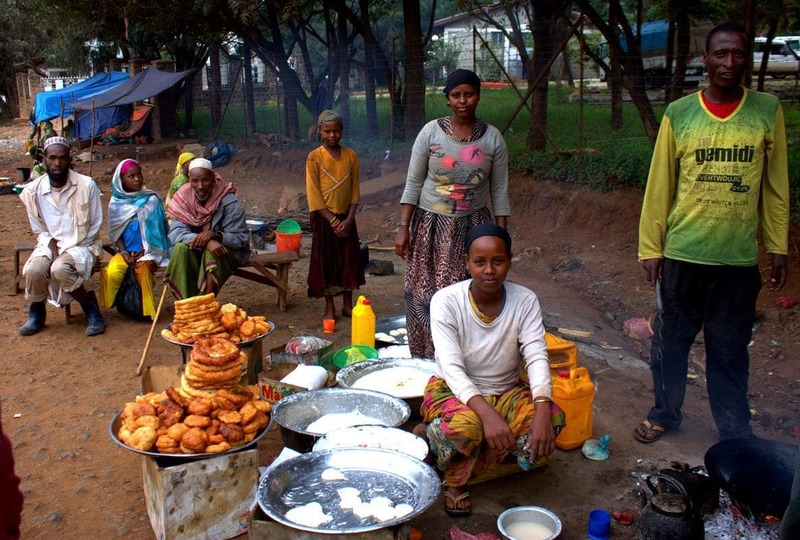 Mulewa is a type of vetkoek that is usually fried as flat bread and is served with honey and Ethiopian coffee. Fetira, prepared on a wok, consists mainly of egg. Fetira can be ordered as a two-egg or a four-egg dish. A soft dough is skillfully whirled in the air to flatten it and then fried on an oiled wok. For the two-egg dish the whisked eggs are poured on top of the dough which is then folded into a neat square parcel and fried on both sides. Then it is cut into squares and served. For the four-egg dish, instead of folding the eggs in, it is poured onto the dough, together with chopped tomatoes, onions and chilli, fried and sliced finely before it is served with bread. Best of all, I enjoyed the fresh fruit juice for which Ethiopia is less well-known than for its fine coffee. 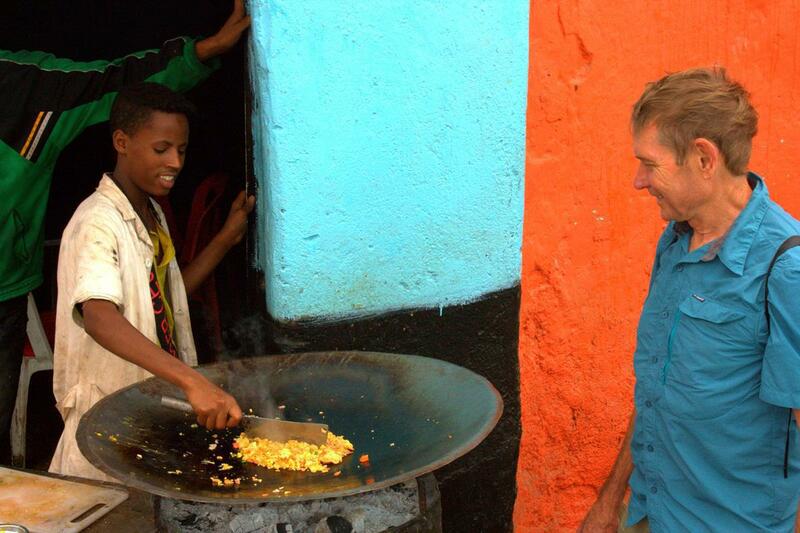 As it was a two-day drive to pick up visitors in Addis Ababa, we only could spent two nights in Harar. We camped en-route in the Awash National Park, where after the hustle and bustle of Harar, we enjoyed the sound of the river and the large shade trees, a few metres from the Awash River. 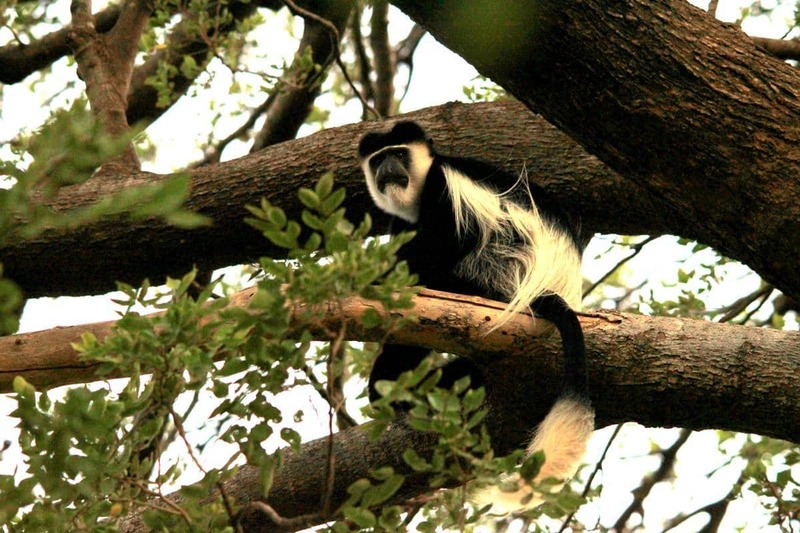 Grivet and Guereza monkeys played in the trees and Olive baboons lingered around camp in hope of scraps to eat. 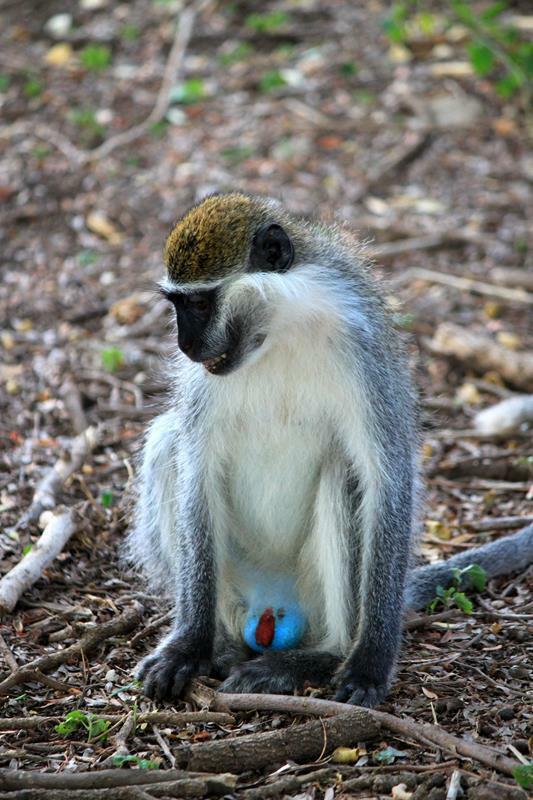 The Guereza monkeys are quite elusive. Upon driving out we stopped by the spectacular Awash Falls. The 200m wide falls were in full flood, gushing gallons of brown water to beneath. What a sight in this arid part of the country! We were lucky to see the Awash Falls in full flood. 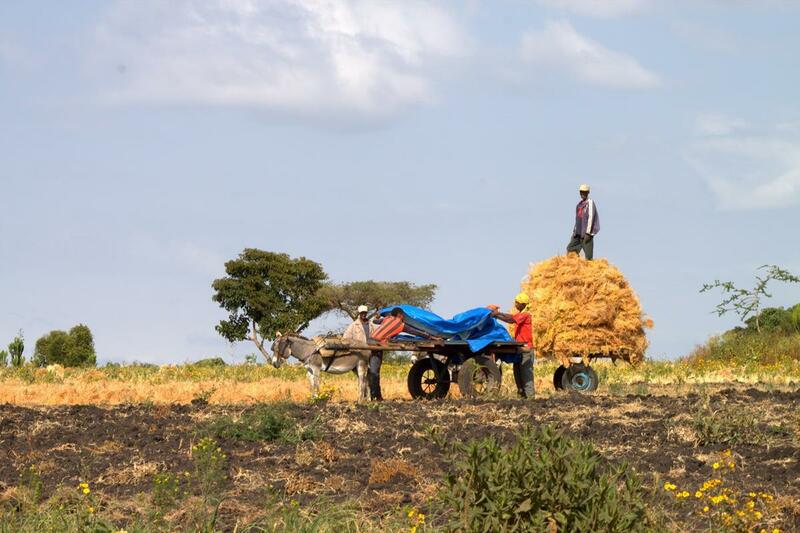 We lived in Bale for five years and have worked on caves in Kenya. Sof Omar is a mere baby, but very beautiful, at only 1.5km long, Leviathan Cave in the Chyulu Hills in Kenya is over 11km long! 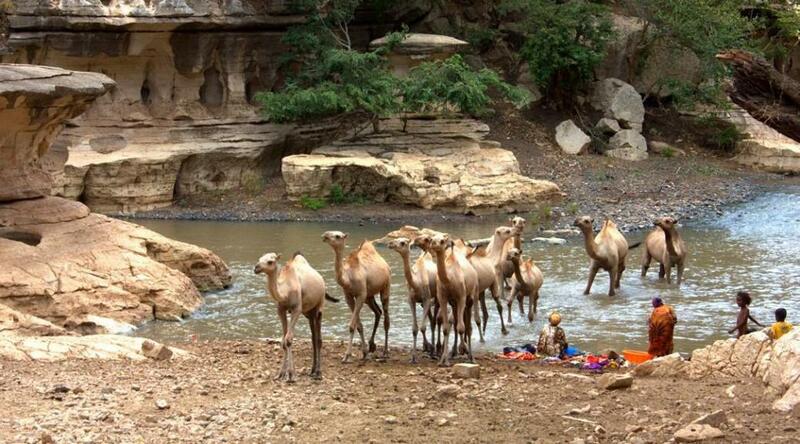 The river is the Web, or Wabe Shebelle that flows from Bale, through Sof Omar, and on to the sea in Somalia. Your Bale “cactus” is a thistle, and the Rail is the endemic Rouget’s Rail. Jou fotos is stunning en die stories heerlik. Sal graag van die fotos wil skilder. Geniet en pas julle self op. Stunning!Photo’s never do the real experience the justice it deserves so I can just imagine what it must be like actually being there-goosebump stuff!Never imagined Ethiopia would be so beautiful.